Washington D.C.: The National Security Archive today posted a selection of secret Cuban government documents detailing Cuba’s policy and involvement in Africa in the 1960s and 1970s. 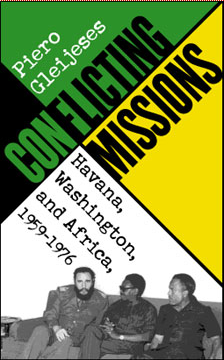 The records are a sample of dozens of internal reports, memorandum and communications obtained by Piero Gleijeses, a historian at the Johns Hopkins School of Advanced International Studies, for his new book, Conflicting Missions: Havana, Washington, and Africa, 1959-1976 (The University of North Carolina Press). The United States knew about South Africa’s covert invasion plans, and collaborated militarily with its troops, contrary to what Secretary of State Henry Kissinger testified before Congress and wrote in his memoirs. Cuba made the decision to send troops without informing the Soviet Union and deployed them, contrary to what has been widely alleged, without any Soviet assistance for the first two months. Professor Gleijeses is the first scholar to gain access to closed Cuban archives—a process that took more than six years of research trips to Cuba—including those of the Communist Party Central Committee, the armed forces and the foreign ministry. Classified Cuban documents used in the book include: minutes of meetings with Fidel Castro, Che Guevara’s handwritten correspondence from Zaire, military directives from Raul Castro, briefing papers from intelligence chieftain, Manuel Piniero, field commander reports, internal Cuban government memoranda, and Cuban-Soviet communications and military accords. In addition to research in Cuba, the author also worked extensively in the archives of the United States, Belgium, Great Britain, and West and East Germany, teaching himself to read Portuguese and Afrikaans so that he could evaluate primary documents written in those languages. In this first account of Cuba’s policy in Africa based on documentary evidence, Gleijeses describes and analyzes Castro’s dramatic dispatch of 30,000 Cubans to Angola in 1975-76, and he traces the roots of this policy—from Havana’s assistance to the Algerian rebels fighting France in 1961 to the secret war between Havana and Washington in Zaire in 1964-65 and Cuba’s decisive contribution to Guinea-Bissau’s war of independence from 1966-1974. “Conflicting Missions is above all the story of a contest, staged in Africa, between Cuba and the United States,” according to its author, which started in Zaire in 1964-65 and culminated in a major Cold War confrontation in Angola in 1975-76. Using Cuban and US documents, as well as the semi-official history of South Africa’s 1975 covert operation in Angola (available only in Afrikaans), this book is the first to present the internationalized Angolan conflict from three sides—Cuba and the MPLA, the United States and the covert CIA operation codenamed IAFEATURE and South Africa, whose secret incursion prompted Castro’s decision to commit Cuban troops. Conflicting Missions also argues that Secretary Kissinger’s account of the US role in Angola, most recently repeated in the third volume of his memoirs, is misleading. Testifying before Congress in 1976, Kissinger stated “We had no foreknowledge of South Africa’s intentions, and in no way cooperated militarily.” In Years of Renewal Dr. Kissinger also denied that the United States and South Africa had collaborated in the Angolan conflict; Gleijeses’ research strongly suggests that they did. The book quotes Kissinger aide Joseph Sisco conceding that the Ford administration “certainly did not discourage” South Africa’s intervention, and presents evidence that the CIA helped the South Africans ferry arms to key battlefronts. The book also reproduces portions of a declassified memorandum of conversation between Kissinger and Chinese leader Teng Hsiao-p’ing which shows that Chinese officials raised concerns about South Africa’s involvement in Angola in response to Ford and Kissinger’s entreaties for Beijing’s continuing support. The memcon quotes President Ford as telling the Chinese “we had nothing to do with the South African involvement.” Drawing on the Cuban documents, the book challenges Kissinger’s account in his memoirs about the arrival of Cubans in Angola. The first Cuban military advisers did not arrive in Angola until late August 1975, and the Cubans did not participate in the fighting until late October, after South Africa had invaded. In assessing the motivations of Cuba’s foreign policy, Cuba’s relations with the Soviet Union, and the nature of the Communist threat in Africa, Gleijeses shows that CIA and INR intelligence reports were often sophisticated and insightful, unlike the decisions of the policymakers in Washington. January 13, 1976, Department of State Cable, “Cuban Military Intervention in Angola: Report Number 9.” (Document obtained from Department of State files through FOIA). The Department of State reports on the Soviet flights of Cubans to Angola. “Cuba may have begun to use 200 passenger capacity IL-62 aircrafts (Soviet) in its airlift support operations.” The document also makes estimates on the number of Cubans fighting in Angola, and speculates on possible military maneuvers to occur in the near future. January 6, 1976, Memorandum from Cuban Army, “Conversation with the Soviet Ambassador.” (Document from the Centro de Informacion de la Defensa de las Fuerzas Armadas Revolucionarias, CIDFAR, [Center of Information of the Armed Forces]). In this memorandum a high ranking Cuban military official describes a meeting with Vitali Vorotnikov, Soviet Ambassador to Cuba, in which he informs Raúl Castro that Aeroflot will provide ten charter flights to fly Cubans into Angola. Most other countries had refused the Cubans landing rights under pressure from the United States. The Soviets offered these ten flights, but no more. December 18, 1975, Cable from Arquimides Columbié, [Political Situation in Angola]. (Document from the Centro de Informacion de la Defensa de las Fuerzas Armadas Revolucionarias, CIDFAR, [Center of Information of the Armed Forces]). December 3, 1975, White House Memorandum of Conversation with Chinese Officials, “The Soviet Union; Europe; the Middle East; South Asia; Angola” (Document obtained by National Security Archive, from National Archives Record Group 59. Records of the Department of State, Policy Planning Staff, Director’s Files (Winston Lord), 1969-1977, Box 373). August 11, 1975, Memorandum, “Report about my visit to Angola,” from Major Raúl Diaz Arguelles to Major Raúl Castro Ruz. (Document from the Centro de Informacion de la Defensa de las Fuerzas Armadas Revolucionarias, CIDFAR, [Center of Information of the Armed Forces]). This memo describes meetings between the Cuban representatives and Angolan President Agostinho Neto. In his report to the head of the Cuban Army Raúl Castro, Raúl Diaz Arguelles talks about handing over 100,000 dollars to the MPLA as well as fielding their requests to train Angolans both in Cuba and Angola. Neto goes on to complain about lackluster Soviet aid and expresses his wish to turn Angola into a “vital issue in the fight between imperialism and socialism.” The Cubans agree, and Diaz Arguelles recommends helping the Angolans “directly or indirectly” in their cause. November 22, 1972, Memorandum, “The Shipment of Comrades to Angola and Mozambique,” From Major Manuel Piñeiro Lozada to Major Raúl Castro Ruz. (Document from the Centro de Informacion de la Defensa de las Fuerzas Armadas Revolucionarias, CIDFAR, [Center of Information of the Armed Forces]). This document, written by Cuba’s famous intelligence operative, Manuel Piñeiro, shows the early Cuban Government contacts with the MPLA (Popular Movement for the Liberation of Angola) and original MPLA requests for low-level training and logistical assistance in Angola. The memo describes Cuban plans to send a delegation to Angola and Mozambique to ascertain what kind of support Cuba could give to independence struggles in those two nations. This report by the CIA’s National Board of Estimates describes a low point in relations between Moscow and Havana shortly after Che Guevara’s death. The report begins by bluntly stating, “Brezhnev thinks that Castro is some sort of idiot, and Castro probably isn’t too fond of Brezhnev either.” Much of the tension between the two allies, according to this analysis, has been caused by Cuba’s encouragement of guerrilla warfare in many Latin American countries while the Soviets tried to expand both diplomatic and economic ties with those governments the Cubans were trying to overthrow. November 14, 1965, Letter, Che Guevara to Oscar Fernandez Padilla. (Document obtained from Archivo del Comite Central, [Archive of the Central Committee]). In this handwritten letter, Che Guevara, using his code name “Tatu,” the Swahili word for the number three, writes to Fernandez Padilla (code name “Rafael”) who heads the Cuban intelligence operations in Dar-es-Salaam. Padilla’s unit is providing support for the Cuban presence in Zaire. In his letter, Guevara describes some of the organizational problems that were common in this operation including carelessness with money, and the need for multivitamins and access to a grocery store to avoid malnutrition among Cuban personnel. A week after the letter was written, on November 21st, Cuban troops, including Che Guevara, withdrew from Zaire. October 20, 1963, Memorandum, Ministry of the Revolutionary Armed Forces, Cuba, Major Raúl Castro to Majors Flavio Bravo and Jorge Serguera. (Document from the Centro de Informacion de la Defensa de las Fuerzas Armadas Revolucionarias, CIDFAR, [Center of Information of the Armed Forces]). On the eve of the first Cuban military mission to Algeria, Major Raúl Castro, head of the Cuban Armed Forces, writes a memorandum to two of the leaders of the mission with specific rules of conduct for the Cuban troops while in Algeria. Castro stresses extreme self-control amongst the troops, prohibiting alcoholic beverages, or intimate relationships with women; as well as humility, imploring the men to be modest and not “act like experts.” Along with the code of conduct, Castro encourages “complete and absolute” respect for Algerian customs and religion. While Che Guevara looked into possible Latin American operations, Raúl Castro supervised this early operation in Northern Africa.